I just came across this image for the first time. I had no idea Jack Kirby did Akira, but it made me cackle. This is the most perfect expression of my style. Bold American Kirby, a Jew from the Lower East Side, and Otomo Katsuhiro. Japan’s voice of a troubled, ambigously nervous 80s, much like Alan Moore’s Watchman. Throughout all these proceedings there is action. This is a Jack Kirby adaption of the Japanese manga classic Akira by Otomo Katsuhiro. See what I mean? I never had evidence of a “common ancestor” of my Japanese and American styles, but now I do. Once again, thanks to Jack Kirby (standing ovation). I love that michael jackson jacket. This was definitely something he did late in his career, but I love the four or five elements in the cover that tell you Kirby definitely picked up a copy of Otomo Katsuhiro’s Akira. There is a photograph in box in my house of me at six, laying out all my brother’s comics, and comparing them to a large stack Mike Hagan brought over. They were 12, but Mike’s brother Bobby (my age) was there too, to see the haul, layed out in rows on the carpet. I still remember this moment, in 1972. I arranged all the comics to you could see all the titles. That way, if you stepped back, you could see the haul in neat columns, or go in close to check out one particular issue. One day I would do this with computers. It was a great haul. 40 year later I am still a Jack Kirby devotee. That amazing action scene is Jack Kirby doing the Black Panther for Marvel Comics, mmmmmmmmmmm maybe mmmm 1968-72? Kirby was a work horse turning out high quality work that sold better than everyone, even at DC and the other publishers. I drew pictures I wanted to study freehand for about 20 years from that tender age of six (Kirby U, can’t beat the tuition), until I moved on to find out how other artists solve problems in their work with line and drawing humans and other things. 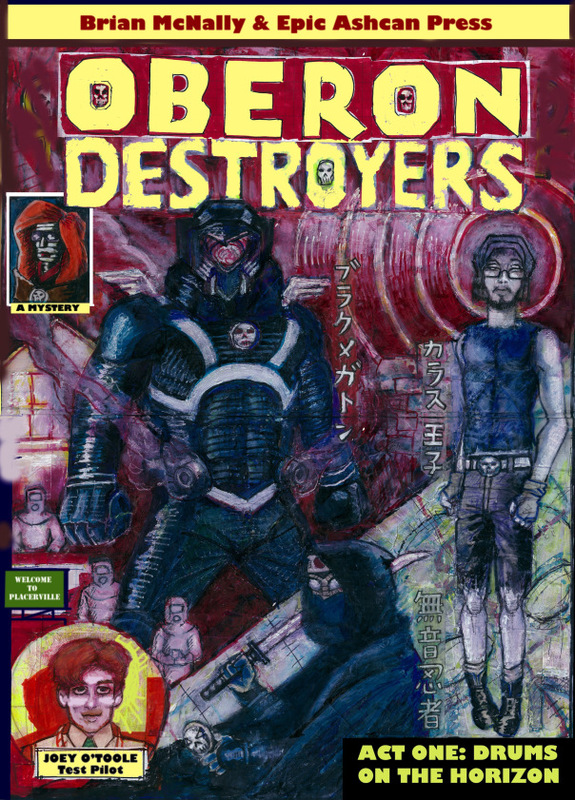 The work that right now displays my Kirby and Japanese influence the most is JUMP TEST, issue 3 of my series Oberon Destroyers. This is the one with the face that got ripped off for the large weekly newpaper WILLAMETTE WEEK in PORTLAND by Xerox Artist Levi Hastings. Each issue feels like an homage to a particular influence. 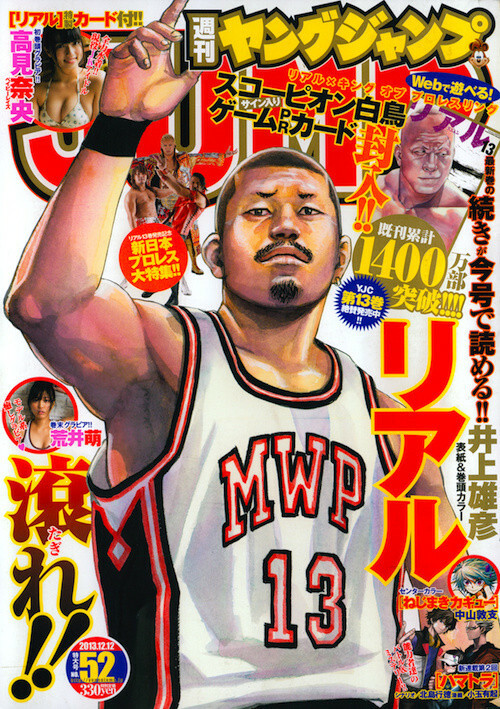 Issue 4 is Ozaki Yutaka. Issue 7 and 11 will be draw from THE MISSING ELEMENT (see below). But first. let’s explore an artist of the doomsday that had a gigantic impact on manga’s visual style. I was one of the first wave of kids to get swept up in Japanese pop culture, which makes me somewhat old school on manga. In 1983, a japanese student stayed at my home for two weeks, and I decided to study Japanese. Three years later I was an exchange student in Tokyo, 1986. I jumped in the deep end, only socialized with Japanese, and became functionally fuent by the end of September, 1986. I lived in Japan off and on, for 14 years. It changes you, and my views on Japanese culture always reflect the sensibilities of mainstream Japanese readers, rather than the person who enjoys Japanese pop culture products by mail to the USA. I like to think that if American culture was taken over by Japan, my life would be a lot more convenient. If you are Japanese, you understand what that means. I read Japanese manga or watch anime in the original Japanese language, which gives you a different set of expectations as to what is ordinary/unordinary. I see the characters not as denizens of a strange land, but as the guy next door. That has always been my take on Japan, and the reason I adapted to the culture and picked up the language so quickly. For an extended look at Akira in great detail, check out the podcast with Scottie Young and Paul Montgomery of iFanboy and Fuzzy Typewriter. They go into so much detail its hard to match. I credit these guys with reminding me of why Akira is important, and helping me realize that Akira changed manga, so therefore changed my work. Otomo’s lasting influence was all over manga I poured over in 1986. Jack Kirby is an engine of action and escape for me, but Tokyo feels like home. Cramped, confined, claustrophobic, oddly dense and sparse urban landscapes, and nothing like Jack Kirby’s world. Make no mistake, Otomo brings the action, but its the stuff that you see in Chris Nolan’s Dark Knight, or Heat. The pacing is all Japanese, slow boil to a big explosion. He also brough a level of rendering and draftsman ship that really raised the bar in Japan, although it seems more animators have been influenced by his visual style and pacing. Neon Genesis Evangelion is a good example. I have deliberately picked the really oridinary examples of Otomo’s work, to show that despite the (always on the simmer) fireworks of Akira, it is still employing the very basic, bare bones manga approach, getting the book out on a tight deadline. American comics from the big publishers have always been full colored, finely rendered and 20 pages a month due to production realities. That puts pressure on the writer to cram in more story, as issues take four weeks to come out. Japanese comics, on the other hand, are line drawings in black and white, 20 pages a week. These are bound up in weekly volumes like YOUNG SUNDAY and YOUNG JUMP that feature up to 10-15 different stories, all “To Be Continued” week to week, with pictures of pretty girls to help sales, massive amounts of paper dumped on the market. LIke I said, this is how I know manga. I didn’t get the curater picks of a few import gatekeepers in Japan, but the whole unwashed volume on cheap newsprint, on sale everywhere, 200 pages weekly (10 or more features) in each of these magazines. Manga accounts for a hefty size of Japanese publishing. The entire first floor of a seven floor book chain (Kinokunia, the largest) devotes its entire first floor to Manga, most of it…. meh. As soon as they started to import to the USA just about anything, the manga boom fell apart. Like any medium. only 1/10 (if even that) are worth reading outside of a train or waiting room. See? Pretty girls completely unconnected with anything in the manga. Sales!! Sales!!! The publishing realities have a incredible impact on how the two tell stories. Japanese manga have a much different pacing to them. In two pages two guys say three words, on a background of almost nothing. A guy launching an attack does just that for one page, just him from three angles and motion lines. Most times backgrounds are seen as a hindrance to deadlines and story telling. Anyone interested in this top should aquire Scott McCloud’s amazing book, “Understanding Comics.” I have not seen anyone else in 20 years in the USA or Japan that understands the difference between American and Japanese comics like McCloud, on the level of drawing style, design, and story telling. His explanation of the appeal of stylized drawing alone is worth the cover price. Stylized ways to convey the action and story in a cheap, quick, and arty manner are pressured out of the artists up against a never ending deadline. It’s amazing what Otomo did despite those pressures, but If a few motion lines convey a moment that feels like Kill Bill, then I feel at home. The boy next door. (motion lines) ARRRR!!! (motion lines) WHACK. But quite a few Otomo splash and two page spreads got the attention of the best american talent at the time, like Frank Miller. Which is funny, because Otomo said he was influenced by American comics. That is the ground where I live – Japanese and Americans passing something back and forth, changing it each time. 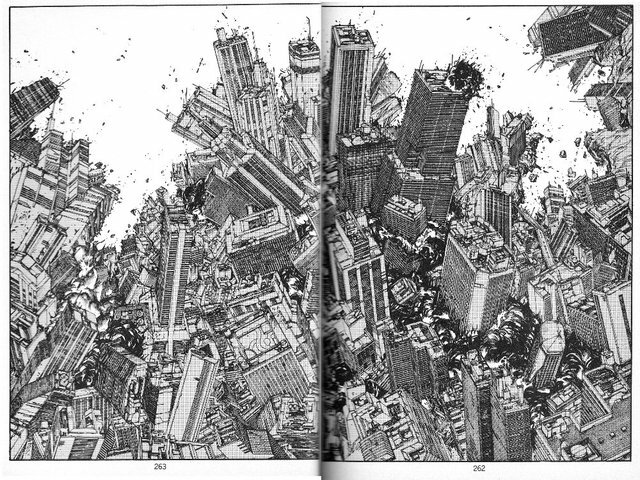 This picture by Otomo could easily be an opening splash page for Kirby’s Kamandi, the Last Boy on Earth. I can do the stylized faces and figures, but I can’t keep up with the draftmanship of the Japanese manga artists. I go crazy if I have to use a ruler. I have to have a loose form, action backed background like Kirby. Kirby is proving his genius after his death. 8/10 of the characters burning up movie screens were Kirby hits in the 60s, with Stan Lee. Thor is Exhibit A. The Avengers is Exhibit B. Kirby built on paper the template for all those movies. It worked then, so it works now, when it all feels fresh and brand new. I love this red. This “tableau” style is highly distinctive of American comics. This is half of my design DNA. Kirby makes sure even the little X-Men are in motion. Kirby struggled to make ends meet and provide for his family. He always knew his greatest acclaim would come after his death. I got to meet him once. Stars in his eyes and nothing but amazing stories for the fans that came to visit with him and get a sketch. Roz Kirby was there too. I think she had to drive for him. This was in 1993, towards the end of his life. Kirby pictures just flow into the next action. You can feel it on the page. The Kirby influence is all over my work. People just can’t seem to understand why it feels so indy on my pages. As if Kirby did a modern indy OGN about someone’s journey of discovery in Placerville. I smell the old smell of pages in my collection, and I feel all that joy of Kirby lifting me up in my childhood all over again. I have quite.a.few. old copies. 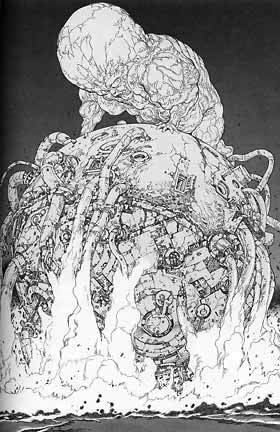 Otomo Katsuhiro’s Akira changed everything in Japan. He was one an important group of artists that form a bridge between the older Osamu Tezuka legacy to the artists that formed the modern idiom of Manga in the late 70s and 80s. Osamu was a member of the war generation, but it was people growing up in the 60s and 70s like Otomo Katsuhiro and Kiuchi Kazuhiro that created the look that still predominates today. Go Nagai sits right on the border between the two. He looks like Osamu, but reads like someone coming out of 70s hippie culture. Osamu drew on Disney and Fleisher. The new guys like Otomo, Go, and Kiuchi were much grubbier. From AKIRA by OTOMO KATSUHIRO (I write family name first in Japanese order). In all my years in Japan I have always picked up discarded manga on trains (common sight) or flipped through a stray copy of Young Jump or another volume, and taken a look at what is current. I can speak Japanese extremely fluently, but reading a manga with alot of manga and slang can be a rough slog. Instead I have always consumed them visually for all the many tricks of story telling they do differently than my American influences. In 1986, Otomo imitators were everywhere. In Japan, Otomo may have had a bigger impact on artists that read him, rather than on a general Japanese public that did not. I think this is the way he got to me – by diffuse osmosis. He was everywhere. But are we missing something that also took over Japanese Manga and transformed the look and feel as much as Otomo? What may have also planted deep roots in my personal style? What was that series called again? What is that third element we can identify in my style? Something about youthful rebellion. And high school humor hijinx. What was that called? US MANGA FAN – Oh, I love manga. I know all the really big names. BRIAN – Oh! Wonderful! So you know all about Be Bop High School? US MANGA FAN – Huh? You can get BeBop High School by Kiuchi Kazuhiro in English now, but it took so long to import, I’m sure the humor feels dated. In the 80s in Japan, BeBop High School was its own giant tidal wave POP CULTURE BOOM that had a huge impact on everything that came after it. 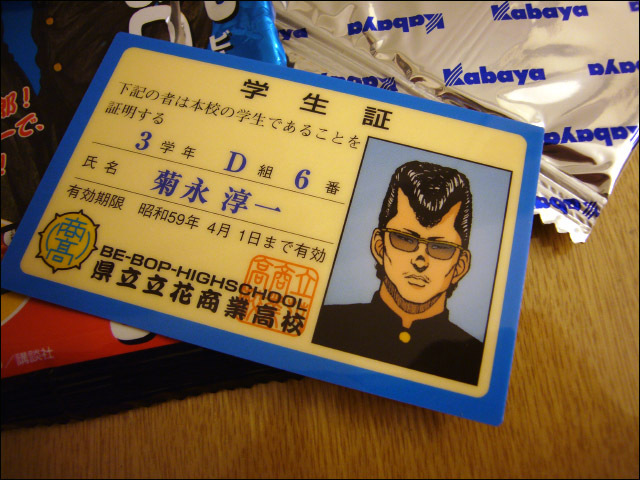 No BeBop High School, no Slam Dunk. It may have been the first japanese popular title to feature counter culture charactes. BELOW – fan makes student ID for one of the main characters. Made me laugh. That’s really well done. Its the tinted glasses that really make the picture, LMAO. What American manga fans fail to understand (with good reason, not their fault) is that Japanese manga are carrier waves of the nation’s latest slang. Writers in the Japanese language, especially humor writers, are super serious about phrasing things just right and reflecting the latest youth culture. Japanese are as keen about their own language as the British, which is something you see on display in any Doctor Who episode. If I had the time and venture capital, I would love to try and translate this stuff right so Americans can enjoy it too, in the original flavor. I think I could do it, but it requires a certain skill set. At the time (late 70s, early 80s), Japan was experienced a huge surge in teen gangs and anti-social hoodlum behavior at high schools. The latest teen gang incidents were always top of the news. The dimesions of the public debate felt then like talk of sagging pants feels now. The sober established issued the warning, and the pop culture ran to the contraband goods like addicts. 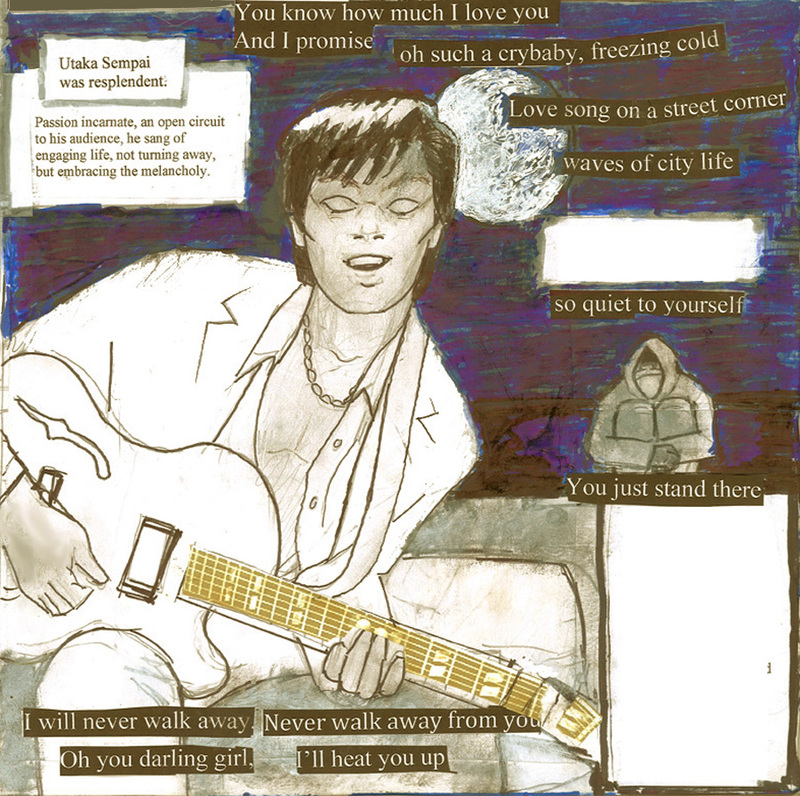 Ozaki Yutaka (link to video), a rock and roll artist I celebrate on this site frequently and in the pages of my comics (see above), was the voice of this generation. He feels like those Be Bop High School kids sometimes because he partied with the real thing from age 14. If you watch as many Ozaki videos as I have, you realize he never changed that hairstyle. 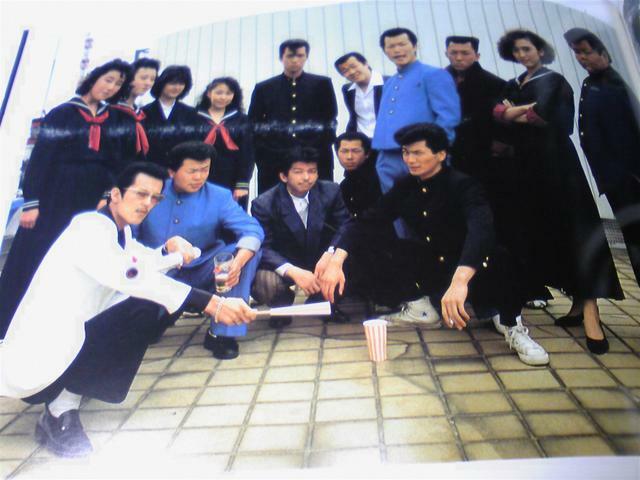 All of my friends my first year in Japan (1986) were not hoodlums, but the dudes all loved Ozaki Yutaka. My friends went to high school during all the furor about gangs. They probably knew kids like these BeBop guys. They were the brothers in the hood. There was also a rougher, courser, working class feel to the proceedings at Bee Bop High School. Get me drunk and I can talk like these guys in Japanese. Seriously I had good teachers in 1986. That got drunk with me and taught me Japanese. 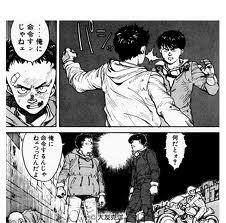 And they talked in all that glorious teen hoodlum slang that the readers adored and found so funny, like junior yakuza. It broke the rules of polite talk. WIth teen hoodlums, gangster slang found fresh young voices. The rock a billy hair and way they altered their school uniforms was a fundamental point. In other words, Be Hop High School, like much wide appeal humor, was very language and culture specific. If the main character rolls his R a certain way, in a shoes box drama, Americans don’t get it. These were also the real kids in the hood, rather than Japanese mainstream media angels next door. What is Be Bop High School? Imagine Archie Comics. Now imagine Archie and Jughead start wearing sagging jeans and hoodies, and talking like “gangstas.” Now imagine you are still reading Archie Comics, a teen humor strip. That’s what Be Bop High School is. Archie Comics with a teen hoodlum twist. That’s really all it is. And lots of gags and teenage drama in High School – does she like me or not, guffaw guffaw. Kiuchi just imported young gang culture into the standard humor genre. And people love it. There were movies and TV. Of course there was – all that slang humor begged to spoken by an actor. The simplicity of the look and feel of the preceedings, stripped down to the basic essentials, is art for the soul. I plan on dipping into BeeBop High School for a refresher course on school comedy for my 11th issue. My style? Imagine Otomo of Akira and Ambiguosly Nervous fame doing something about a school with young hoodlums that are just plain silly, hahahahahah guffaw guffaw, under a strange cloud of doom (Evangelion, basically). Something like that. I can make it work. This hybrid stuff is now second hand nature for me as an artist. I spent most of my adult life in Japan. The cast of the TV show, of course looking just like the comic – doing the homeboy squat. You gotta squat to be a true homeboy, and you gotta have the walk. RESPECT!!!! IT WAS ENORMOUS IN 1986 — seemed like every character in any kind of show (action, Skebban Dekka) had to be a reformed hoodlum. But everyone knew the first and foremost – Be Bop High School. And that is in my design DNA too. I am quite the hyrid. However, you should be able to easily detect the common threads that run through all of it, because all of it is me. Basically, just Jack Kirby does Akira, at Be Bop High School. 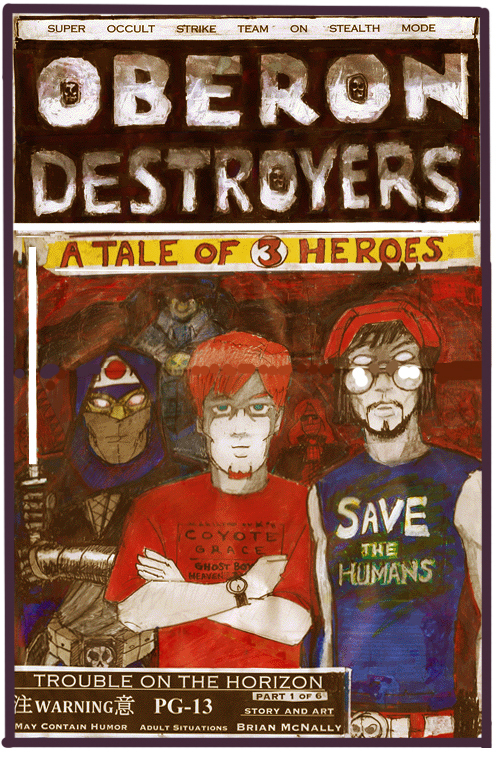 Don’t forget to browse my work in Oberon Webcomics and/or Free Sample section. IF you feel I am good enough to NOT be ripped off by a major newspaper, then have a quick look at a case where someone ripped my unique hybrid style right off with a scanner. And a major newpaper printed it in Portland as a cover under his name. He doesn’t seem to realize that his work looks like a Japanese Jack Kirby, but he doesn’t know Jack Kirby, and he’s never been to Japan. Letter to the editor (see link) are always welcome. I could use the support. Thanks Jack, you were the best. Nobody flew an airplane quite like you. Above – Jack Kirby, the Eternals, Marvel Comics.